“What Is It About The Water? 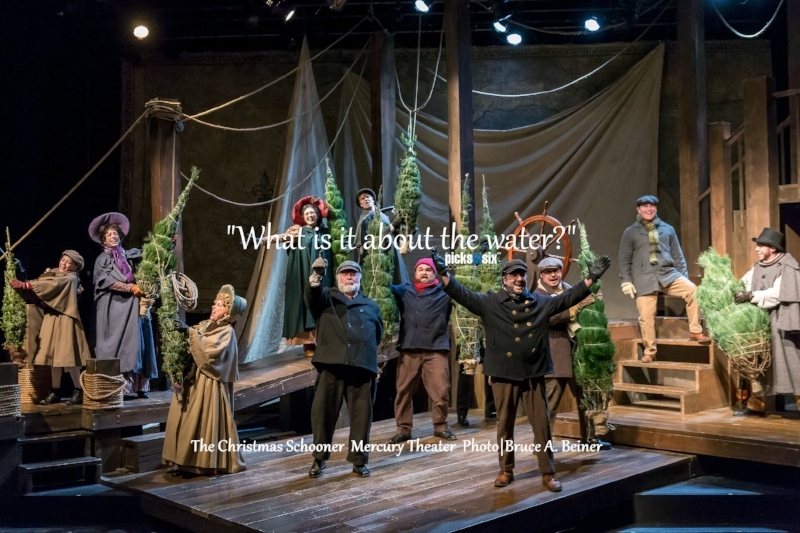 The backstory… The shipwreck of the Rouse Simmons, the first “Christmas Tree Ship”, is the inspiration for The Christmas Schooner: A Musical with book by John Reeger and music and lyrics by Julie Shannon at Mercury Theater Chicago. 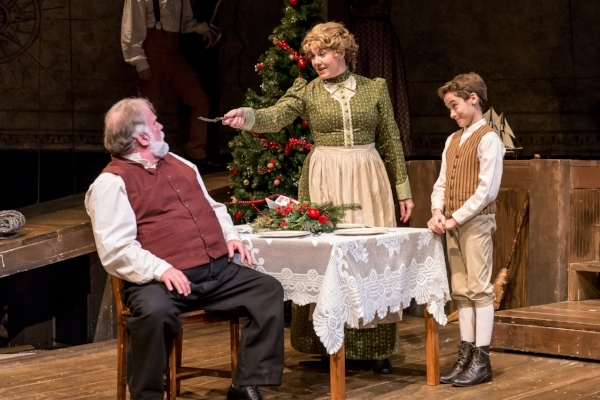 At its heart, this Chicago holiday classic is everything it says it is: “a story of a boy, a schooner and a letter” and answers the question "What is it about the water?" You may be surprised to discover the backstory of the courageous efforts of one man to inspire a crew, and ultimately his family, to bring the spirit of Christmas to Chicago from Northern Michigan. Along the way, there is the story of the first Christmas tree (although there appears to be some respectful dispute about the names of the individuals involved) and you will certainly be at first captivated, then, enchanted, by the simple joys of the holiday season embodied in the gloriously rich harmonies of the seasoned professional cast. Why you should go… The dramatic narrative story of this musical is rooted in fact, and the intimate atmosphere of the Mercury Theater – opened as a silent film theater in 1912, the year that the Rouse Simmons went down – combines perfectly with the lush vocals and staging to make the Walter Stearns directed production, with crisp choreography by Brenda Didier, the perfect holiday experience for the whole family. What stands out… Brianna Borger’s touching performance as the strong Alma is balanced with the quiet, commanding presence of Stef Tovar’s Peter Stossel. Borger’s “Questions” is beautifully sung. Tovar leads several company numbers, but “Struedal Waltz” with Borger and “The Letter” with Nicole Armold both shine. Don Forston gobbles up the tough and tender role of Uncle Gustov. The company numbers are splendid including a soaring rendition of “We All Have Songs” and the haunting “What Is It About The Water?” There is a brisk tailwind provided by the ensemble notably Ron Keaton, Harter Clingman and Kelly Anne Clark. Karl, the coming-of-age lad, is played smoothly as a nine-year old by Leo Gonzalez and later, at fifteen, by the talented Christian Libonati, who leads the company in the rousing “Hardwater Sailors.” The rugged, versatile set evolves seamlessly from the Stossel home to a ship’s deck raging in a storm and the pier on Clark Street in Chicago. The takeaway… We all have a story to tell and the true joy of Christmas is in our service to others, to be given, and then passed along. If we grieve, it is because we have been loved... and we have loved. Season of Carols… following the performance, the cast joins in supporting Season of Concern. You can take home the Season of Carols Volume 5 CD with 15 holiday selections performed by casts of shows all over Chicagoland including: Trevor(Writers Theatre), Mamma Mia(Marriott Theatre), Mary Poppins(Mercury Theater Chicago), Spamilton(Royal George Theatre Cabaret), A Christmas Carol (Goodman Theatre), LIZZIE (Firebrand), Million Dollar Quartet(Paramount Theatre) among others. Mercury Theater’s Eugene Dizon and Cory Goodrich have assembled fine feature performances from Sophie Grimm, Cassie Slater, Danni Smith, Liz Chidester, Tom Vendafreddo, Yando Lopez, Michelle Lauto, Chuckie Benson, Kavan Hashemian, Michael Kurowski, Kent M. Lewis, Doug Pawlik and many more. Buy the CD and support Season of Concern! Coming soon-Venus Cabaret Theater… Southport Avenue is soon to welcome another hot spot. Venus Cabaret Theater, the new, intimate dining and performance space will be opening in the spring of 2018. It promises to be a place “where storytelling, music, dance, comedy and variety acts are paired with food and drink.” With valet parking and new options, Venus Cabaret Theater sounds like a great addition to the neighborhood. Stay tuned!